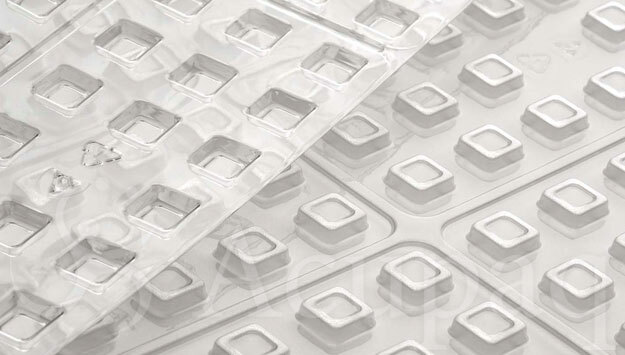 Acupaq provides leading companies across the globe with thermoform trays and packaging for medical, electronics and consumer purposes. We pride ourselves on providing innovative, reliable and cost effective precision packaging solutions whatever the requirement. Our production takes place in Class 100,000 clean room environments, providing precision and excellence at every point along the production line. To meet our customers requirements, we can achieve 100% traceability and with each of the state of the art thermoformers we can programme each former with precise instructions monitoring temperatures, pressure and cycle time. Our technology allows for complete cohesion with our logistics department to enable forecasting, scheduling, tracking, inventory control, shipping and maintenance. Throughout the thermoforming operation our sophisticated robots simultaneously check part thickness, tolerances, fit, function and aesthetics before despatch. To discuss any of your thermoform requirements, please contact one of our sales team for more details.